Primavera! Spring is here! And although I am thrilled to welcome this gorgeous season, the bounty of lovely spring fruit that brings us such pleasure has not yet arrived. So I turned to my pantry to retrieve a jar of cherries from last season, put away for just such a moment: a taste of spring, even if we’re not quite there yet. 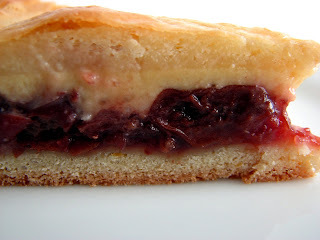 One of the things I love to do with cherries is to bake a Gâteau Basque. There are several different variations based on region, family history and personal taste preferences, but the basic concept is nearly always the same. A thin pastry filled with some preserved fruit and more than likely some crème patisserie or pastry cream. Gâteau Basque is an absolutely delicious salute to the gorgeously gastronomical Basque region of Spain. 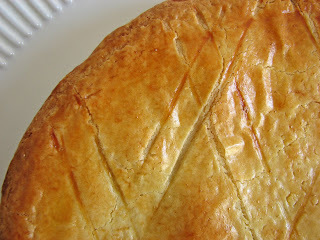 Gâteau Basque originated in the 17th century in the Cambo province of Labourd. At that time, the pastry was made from corn flour and lard and was baked in the shape of a little pig. The Gâteau transformed over time to include the addition of local jams and toward the end of the 19th century, the addition of custard. It was common in old times to fill the pastry with jam made from black cherries from the little village of Itxassou near Saint-Jean-Pied-de-Port, where they celebrate with a cherry festival in June. This rendition is a fairly classic one. A thin pastry crust is filled with sour cherry preserves and pastry cream. It is the first kind I ever tasted and I thought it was superb. I’ve also made François Payard’s version, which is actually a cake batter filled with cherries and pastry cream. And there is another version from David Lebovitz, filled only with a prune compote. We’ll get to them eventually so you’ll have the pleasure of sampling them all. They are each in their own way really excellent pastries and all in keeping with the robust Basque tradition. - I take the crust recipe from Food and Wine. I recommend that you use the best sour cherry preserves you can find because that is the dominant flavor of the pastry. I used a combination of some cherries I had preserved along with some fresh cherry jam. Italian Amarena cherries are also wonderful in this, although they are quite expensive. When fresh cherries are available, I make a fresh cherry compote and use that. Soon! - I used a flan ring but you can use a tart pan or, in a pinch, use a pie dish. - The pastry dough can be made a day ahead and stored in the refrigerator. - This pastry is best eaten fresh, but will keep in an airtight container in the refrigerator for a couple of days. For the pastry dough, place the sugar, butter, lemon zest and salt in a food processor and pulse until it is blended. Add the egg and egg yolk and pulse until mixed. Whisk together the flour and the baking powder and add to the processor and pulse until a dough forms. Turn the dough out onto a piece of plastic wrap and divide it into 2 pieces, one slightly larger than the other. Pat the dough into disks and wrap in plastic. Refrigerate until firm, at least 30 minutes. For the pastry cream, whisk the sugar with the egg yolks until pale. Add the flour and cornstarch and whisk until smooth. Heat the milk just until it starts to show signs of coming to a boil. Gradually add 1/2 of the hot milk to the sugar-yolk mixture, whisking vigorously to prevent the eggs from scrambling. Pour this mixture back into the saucepan and cook over low heat, whisking constantly, until the mixture thickens and boils. Take off the heat and stir in the butter. Add the vanilla extract and almond extract or rum. Pour into a bowl and cool slightly. Press a piece of plastic wrap on the surface and refrigerate until chilled and firm. To assemble, remove the dough and let it sit for a few minutes to take the chill off. Butter a 9-by-1-inch flan ring and set it on a baking sheet lined with parchment paper. Working between 2 pieces of plastic wrap or parchment and a bit of flour, roll out the larger piece of dough to about an 11” round. Ease the dough into the flan ring, pressing it into the bottom and leaving a slight overhang. Spread a layer of cherry preserves evenly over the bottom of the tart shell. Layer the pastry cream over the preserves and spread carefully. Roll out the second piece of dough to a 10” round and lay it over the pastry cream. Pinch the edges of the top and bottom crusts together to seal the crusts and trim the overhang. Using a bench scraper, knife or the tines of a fork, score the top crust in a decorative crosshatch pattern. Chill for 30 minutes. Preheat the oven to 325°. Brush the Gâteau with an egg wash made by combining the egg yolk and 1 T milk. Bake in the center of the oven for 45 - 55 minutes, or until the top is golden brown. Let the tart cool completely on a wire rack. Unmold and enjoy a bite of the great flavors of Labourd co-mingled with a bit of influence from the French Pyrenees. Ah, spring! Beautiful. This sounds beyond marvelous and I can't wait to try it. The sour cherry with the pastry cream and pastry layers - ummmmmmmmmm. Now I just need a good use for the eggwhites leftover. I've never had gateau basque, but this sounds amazing! Just beautiful! You've put the preserved cherries to good use. I'm very impatiently awaiting cherry season myself, but have to preserves to get me through. Gorgeous Gateau Basque! Hello bakers and poets and cherry lovers! Thank you for your sweet responses to Gateau Basque. 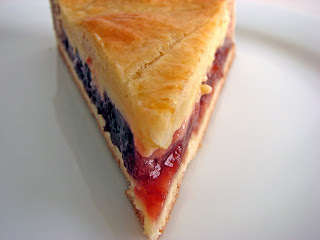 It combines some of my favorite things: fruit, a touch of luscious cream, buttery chewy crust. Yes! And just so you know, I'm working on that egg white thing! Thanks Other Anonymous for your lovely haiku. Mine will also appear when it comes out of the "oven". that looks absolutely stunning. i have a cherry tree that should be fruiting in a month or two, so i['m holding on to this one. You just touched my heart with that one! I am Basque and this is of course, one of my old time favorites. Nothing beats a flaky, crumbly pastry with pastry cream and jam. Perfection! And this one looks just that! My brother, who is still in the Basque Country, bought some at the farmer's market the other day but said it wasn't as good as the one I used to make so he aske me to make it and put it on the blog. So you might be seeing my Gateau Basque soon too! 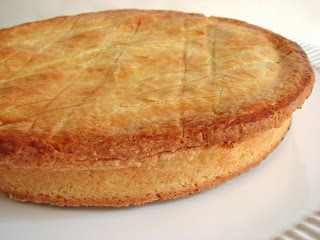 Aran, how wonderful that you have a close history with Gateau Basque! Please let us know when you post your version. I can't wait to sample yours and thanks for cheering all of us on. This really is a lovely pastry. by the way, i just noticed that for march, you have bilbao on the table... my hometown!!! i'm going to cry!!! I made this last week, it was even better than I imagined. I did something wrong: My dough will not hold up to roll out. It is too dry and crumbly. I then decided I will have to work on the dough with my hands, squeezing and rolling into two balls. I put them in the frog for 30 min. I'll let it sit room temp and then roll out. Can anyone tell me where I went wrong when making the dough? I followed the recipe to the T.
Hello, Michael. I'm sorry you had problems with this dough. One thing you want to do when using a food processor is to make sure the butter is cut in and distributed properly after you've added the flour. Keep processing or pulsing until it starts to gather at the center of the machine. The food processor will actually start to make a different sound as it begins to clump. Stop the machine and see if the dough holds firmly together when pinched. I think maybe your dough was under mixed. Even when you go to fix it by hand, it may have still had some areas that didn't have the butter mixture fully incorporated. I hope you won't feel discouraged. Doughs can be trying but practice makes it much easier to judge how it's going by look and feel, when to stop working it so as not to make it tough. I hope this helps.